Spending eight hours a day sitting down is no longer fashionable. Neither is spending eight hours on your feet. The key is balance or, rather, movement. Carrying out daily work activities while in movement and changing between different positions promotes health and physical well-being and leads to emotional happiness. A sedentary lifestyle and muscle passivity slow down our metabolism and reduce enzymes while raising glucose and cholesterol levels. Making up for the long hours spent sitting down with intense gym sessions to loosen joints and muscles is not good either. However, introducing movement in our day-to-day lives is important, especially in traditionally sedentary jobs. In fact, our genetic inheritance goes against spending long hours sitting - in addition to those we spend sleeping in bed. Our ancestors had little time to rest, which is why our health suffers from inactivity. To the motionless hours at work, in the car, on the underground, on the bus, lying on the sofa at home, we can also add the time spent doing nothing during meals. The advantages of incorporating movement and standing work into daily work routines are countless. It improves the harmful effects of a sedentary lifestyle, reducing stress and the risk of suffering from serious illnesses leading to increased life expectancy, as more calories are burned and heart rate and back pain are improved. It also improves mood, humour and productivity, as standing increases attention and encourages completing the task you are working on, with fewer distractions. In fact, it reduces absenteeism - back pain is one of the main causes of sick leave - and encourages workers to be more motivated. 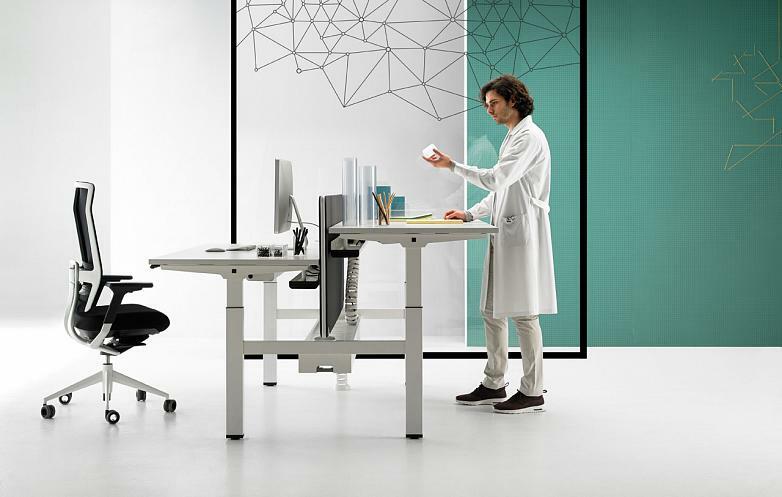 That is why height-adjustable tables are becoming increasingly implemented in workspaces. 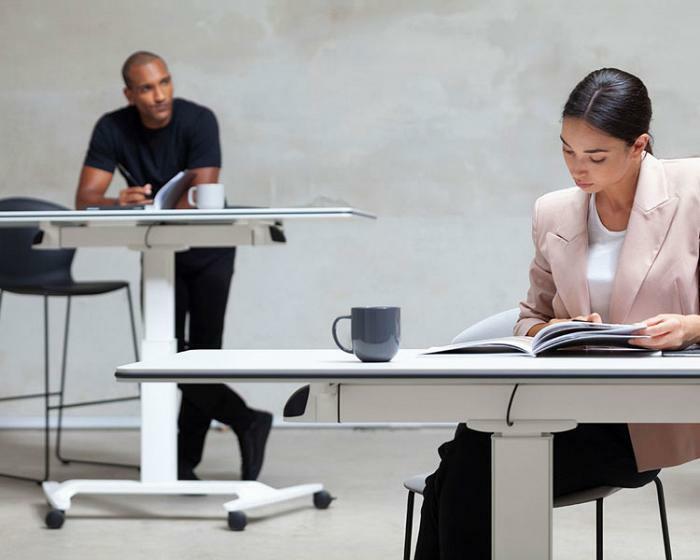 Tables whose height can be modified to adapt to the user's movement needs and that allow to split the workday into periods spent sitting as well as being stood-up, depending on the specific needs of each task and each user. The options are varied, and there are monitoring tables that integrate technology and design - such as Actiu's Power model- as well as others that don’t require electrification and can be raised or lowered by means of a gas spring system - such as the new Talent model, which can also be stacked and folded. Even tables that strictly comply with the most demanding international regulations and that can be raised for each job, such as Mobility. Working standing up is nothing new. The Nobel Literature prize winner Ernest Hemingway worked using a standing desk where he kept his typewriter. Furthermore, the president of the United States, Thomas Jefferson, and the Austrian emperor Franz Joseph of Austria worked standing at their desks, and the long list also includes Leonardo da Vinci, Benjamin Franklin, Charles Dickens, Lewis Carroll, Virginia Woolf and Vladimir Nabokov. 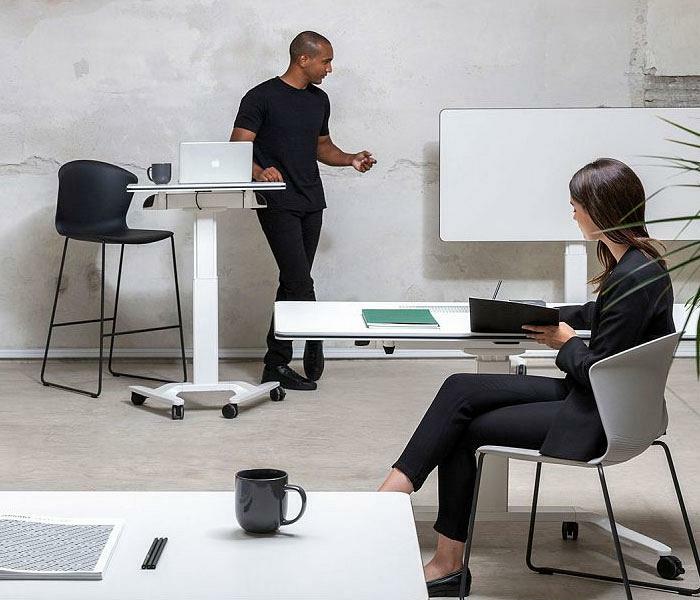 The novelty lies in the flexibility that design and technology now bring to work desks. 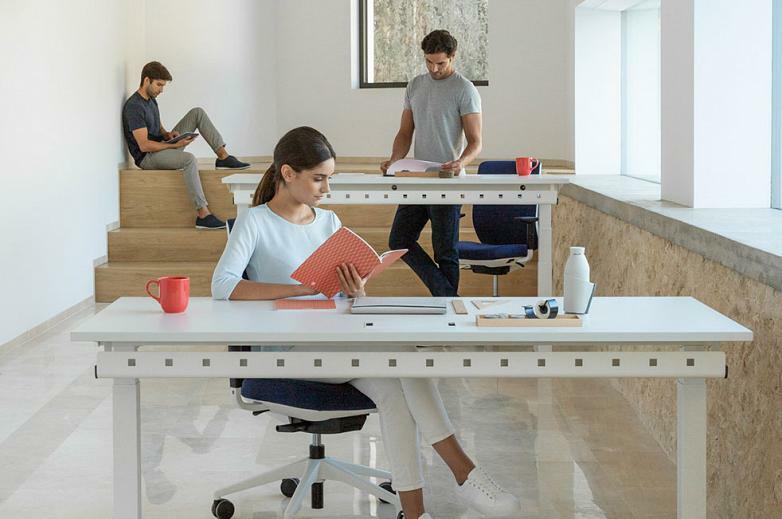 From this improvised historical furniture and specific models for educational and research centres, new height adjustable desks have now become part of work spaces and home offices around the world, resulting in happier, healthier and more productive users. Integrate the routine of working standing up little by little. Start the day by working on your feet and leave the desk raised for the next day before going home. Listen to your body. If you get tired or note discomfort, sit down. If you notice that you get distracted easily or you feel numb from sitting, stand up and recover. Don’t spend more than two hours in the same place, beyond sporadic walks to stretch your legs. You can use a stool for support and listen to music during the periods you are standing to be more comfortable and in order to feel more active.